An old wooden house on West 34th Street is home to Foodheads, a hidden mecca of breakfast, lunch and dinner delicacies. Homemade sandwiches, soups, salads and more are served fresh daily. 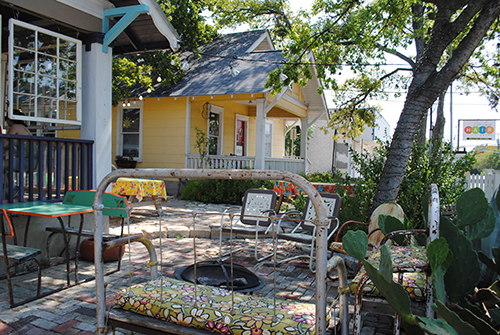 This Austin treasure has been my little secret, my go-to lunch spot, but I can’t help sharing it with you. Early on a Saturday (see my insider tip below on when to dine here), my sister, my friend and I arrived outside the ornate house. A short line settled our roaring stomachs and awoke our zealous taste buds. Eclectic outdoor seating surrounds Foodheads. Long picnic tables line one side of the house. Individual tables are dispersed for a more intimate experience. And lounging areas can be found for those looking to relax. The wrap around porch is speckled with additional tables, offering more seating for outdoor dining. Once inside, an immediate feeling of being at home takes over. Wooden dining tables are scattered about, with just enough room for an ordering line to form. Local pieces of artwork are displayed on each wall. A bookshelf filled with books is nestled in a corner. 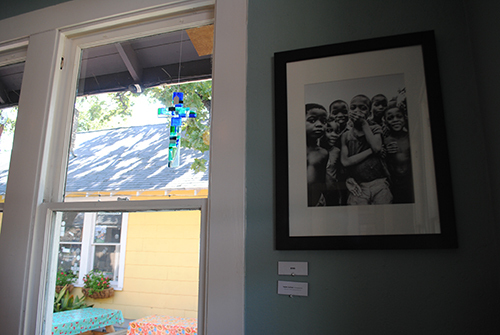 Small stained glass figurines float in each woodpaned window. The house emits a feeling of comfort and coziness, inspiring the food itself to taste as if it came straight from your home kitchen. 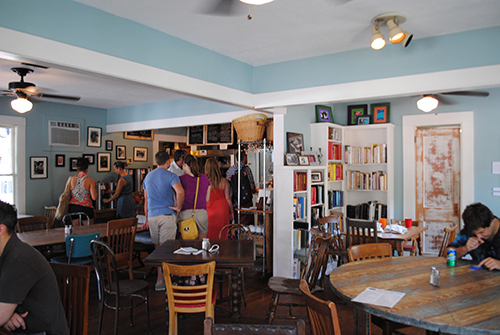 Formerly, Foodheads was a diner’s answer for a tasty lunch. Recently, the restaurant introduced a breakfast and dinner menu, extending their menu items and hours. The breakfast menu contains an Austin must have: breakfast tacos. Breakfast sandwiches and scrambles are also available. While I haven’t had the opportunity to try their breakfast menu, the Ham & Egg Sandwich has me rethinking my morning routine. The lunch menu, a hunger-inducing array of handcrafted sandwiches, soups and salads, is sure to exceed all sandwich and salad expectations (and cravings). The bread is delivered fresh daily from several local Austin bakeries. Soups, salads and side dishes are made in house (including the house made pickles – a must for fellow pickle lovers). There isn’t a lack of freshness in any dish at Foodheads. The dinner menu is made of a unique selection of gourmet dishes. The Coffee Rub Pork Tenderloin caught my attention, as well as the Cottage Pie. My sweet tendencies will also have me returning in the very near future to indulge in the Cinnamon Affogato – a grilled Sweetish Hill cinnamon roll with vanilla ice cream and a shot of espresso. Hello yum. While the menu offers a great selection of dishes, Foodheads’ sandwiches will always be my first pick. 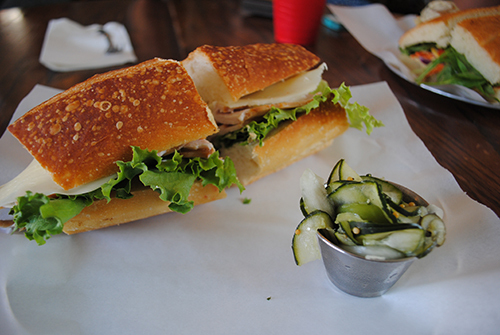 The Chicken & Eggplant sandwich is hands down my sandwich of choice, and one of the best sandwiches in Austin. 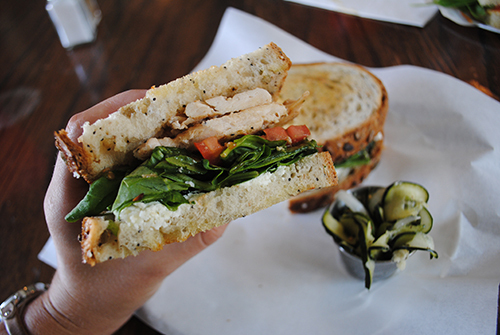 Two slices of toasted multigrain bread embrace grilled chicken breast, spinach, tomato, goat cheese, basil pesto and blackberry balsamic vinaigrette. The slight bite of the goat cheese awakes the sweet, acidic blackberry balsamic dressing. The unrivaled combination of flavors has you timid to share. A ‘build your own’ veggie sandwich menu invites veggie aficionados to design their own veggie sandwich. 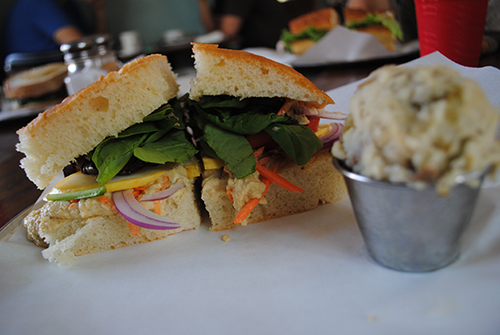 One starts with their choice of bread smothered in house made hummus. An extensive list of veggies and dressings is next, luring a diner to layer the unimaginable. My sister’s concoction included onion, spinach, squash, carrots, and eggplant between slices of thick focaccia bread. The ‘build your own’ mentality also exists for those who have a hankering for a classic deli sandwich. First, one starts with bread, then the stuffing (meat and veggies), the cheese and the dressings. A traditional turkey on baguette satisfied my friend’s simple sandwich craving. A timeless, yet delicious, combination. 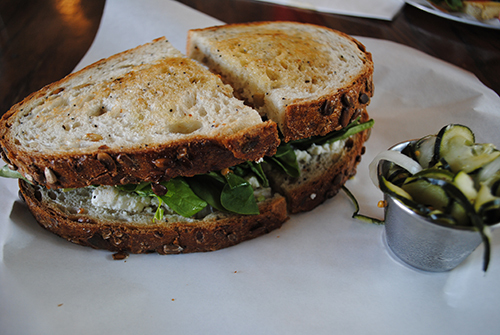 All sandwiches are served with a small side of house made coleslaw, icebox pickles or potato salad. The icebox pickles, my personal favorite, are tangy meets sweet pickles, and are a great addition to any sandwich. 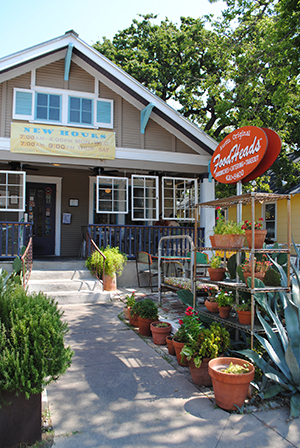 Foodheads is one of Austin’s best-kept sandwich secrets. A secret I highly recommend indulging in. Also, an insider tip from a Foodheads lover: Get to Foodheads early, before the hungry crowd arrives. Our 11:15 AM arrival on a Saturday was perfect, and allowed for a very relaxing, laid back lunch. Enjoy! What sandwich can you not resist at Foodheads?